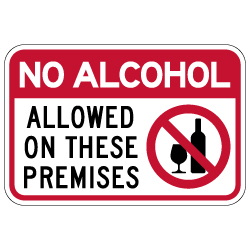 NO Alcohol Allowed On These Premises Signs - 18X12 - Rugged rust-free aluminum signs for indoor or outdoor use. Made of heavy-gauge reflective aluminum with anti-weather and anti-graffiti protection Available. Maintain good boundaries! Use this indoor or outdoor rated rugged aluminum No Alcohol Allowed On These Premises Sign in city parks, campsites, beaches, schools, or other areas you wish to restrict the use and consumption of alcohol. There's a time and a place for alcoholic beverages -- and sometimes NOT. DOUBLE the working life of your No Alcohol Allowed Signs by adding 3M Protective Overlay Film (POF)! 3M’s high-tech POF protects sign faces against fading caused by the sun and harsh weather—and makes graffiti and sticker defacement damage easy to clear away without harsh abrasives.